The $5 Gold Half Eagle Liberty Head are Pre-­1933 gold coins that are extremely popular in the numismatic world. Enthusiastic numismatists love to collect these coins as they are rare to find. Due to their intrinsic value being much greater than their face value, they are also favored by investors. They were minted from 1839­-1908 and they were minted at seven different US Mint branches. The designer of the coin is Christian Gobrecht and the design has a neoclassic influence to it, hence has amazing artistic appeal too. Contains .2419 Troy ounce of .900 pure gold. Obverse – A design by Christian Gobrecht features a leftward facing profile portrait of Lady Liberty with her hair tied in a bun and secured with beaded strings and wearing a coronet on her head with “LIBERTY” inscribed on it. Encircled by 13 stars to represent the 13 original colonies of US. At the bottom is year of mintage. Reverse: Features a heraldic eagle with a shield on its breast and holding olive branches and arrows in its talons, design inspired from the Great Seal of United States. Inscriptions – “UNITED STATES OF AMERICA” and “FIVE D.” Two types in reverse design – without motto (1839-­1866) and with motto “IN GOD WE TRUST” on a banner above the eagle (1866-­1908). Individual coins will be shipped in protective plastic flips. Multiples of 40 will be packaged in plastic tubes. Minted from 1839-­1908, dates and mint mark will be chosen randomly based on availability. Why Buy $5 Gold Half Eagle Liberty? 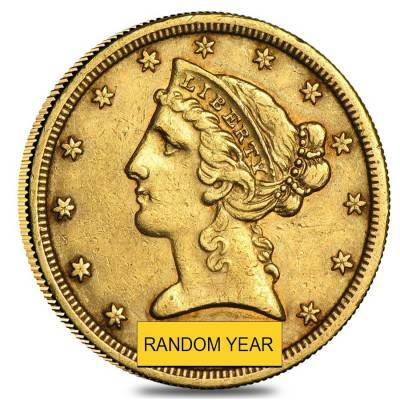 Due to their rarity and age, Pre­-1933 US gold coins provide a solid potential for premium growths. 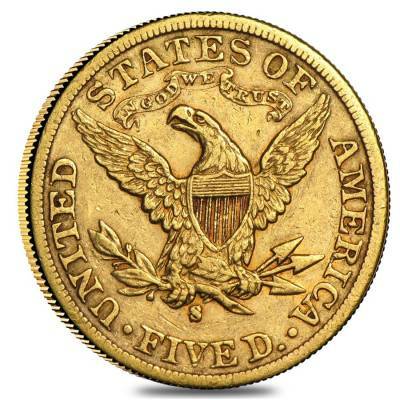 Gold Half Eagles are an affordable option if you want to own pre-­1933 gold coins. Surveys have shown that pre-­1933 U.S. coins are a popular investment option with majority of people. These coins provide easy liquidity which can help you squeeze out of a financial crisis. The prices of the rare coins are less volatile on a day to day basis compared to the gold bullions. They have a fixed supply as these coins are not minted anymore, but there is an ever growing demand for it. The coin will allow you to diversify your investment portfolio along with stabilizing it. The Gold Half Eagles have seen a glorious 134 years of circulation and was one of the favorite coins among Americans then and even now for collecting and investing purposes. The coins were first minted in 1795 after the Act of April 2, 1792 authorized the US Mint to mint these coins. These coins were minted from 1795-­1929 and have seen several changes in designs. The Liberty Head was minted from 1839 and the coin was designed by Christian Gobrecht. The coin is also known as Coronet Head because the obverse features a bust portrait of Lady Liberty wearing a coronet with inscription “LIBERTY” on it. The Liberty Head is classified into two groups based on the reverse design. The coins minted from 1839­-1866 are known as coins without motto which do not have the motto “IN GOD WE TRUST.” The coins minted from 1866­-1908 have the motto “IN GOD WE TRUST” on a banner above the eagle. Other than these two changes, there were no other major changes made to the Liberty Head for almost 70 years. It is one of the longest running series amongst the Half Eagles. These are rare to find coins with historical significance. Since they are not minted anymore, they have fixed supply while the demand for it is growing day by day. Adding these to your investment portfolio will make it very impressive along with the stability and diversification it provides. 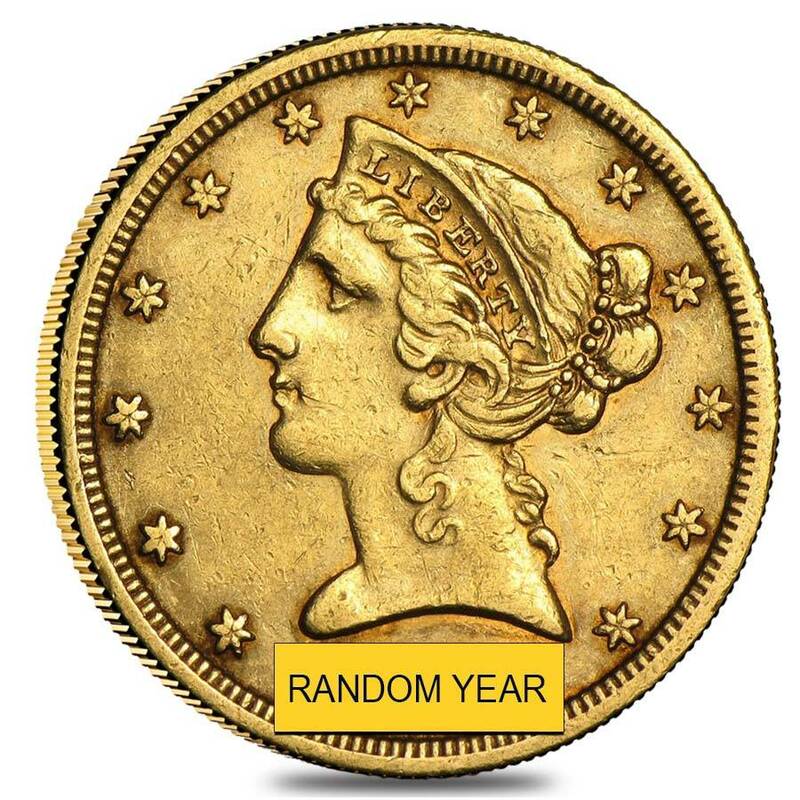 Bullion Exchanges is pleased to offer you these $5 Gold Half Eagle Liberty Head ­ Extra Fine XF (Random Year) at one of the most competitive prices in the industry. Feel free to browse our vast collection of Pre­-1933 Gold Coins today to become a proud owner of an inseparable part of American coinage history. Contact us at 800-­852­-6884 if you have any questions in regards to Half Eagles. With this purchase, you earn 336 Bullionaire Bucks 336 BB = $0.34. For every $1 spend, you will earn 1 Bullionaire Buck which is equivalent to $0.001 off a future purchase. 336 BB = $0.34.